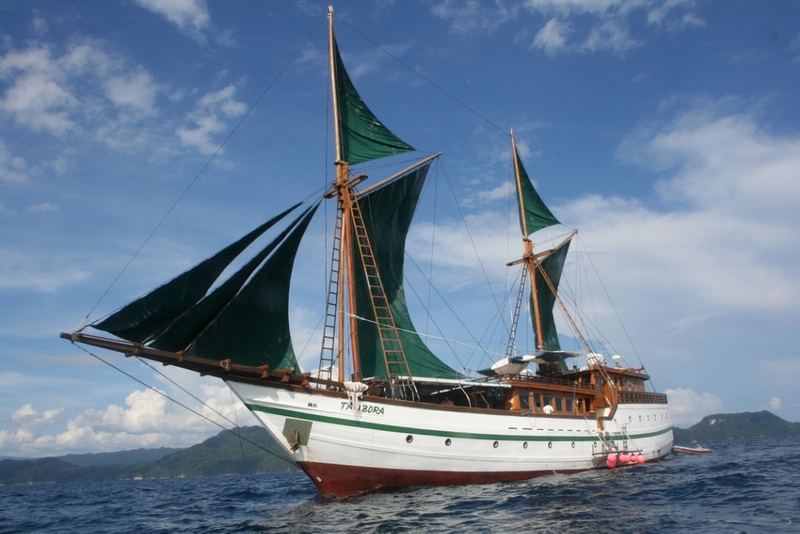 Tambora is a 42-metre phinisi style boat that was custom built with diving in mind. Constructed from ironwood and Javanese teak by the shipwrights of Sulawesi in traditional form, Tambora has been fitted with modern comforts but retains her old world charm. Great care was taken to make the most of space onboard. Her propulsion and electrical systems were engineered for maximum fuel efficiency and she boasts excellent safety features. Tambora sails throughout Indonesia, including Raja Ampat, Triton and Cenderawasih Bay, The Banda Islands, Borneo and the Celebes Sea and the Sulawesi coast. While she regularly operates cabin trips, Tambora is an excellent choice for a large group looking to discover Indonesia’s underwater world alongside an experienced crew including a cruise director, dive guides and a private chef. Each of Tambora’s 8 air-conditioned guest cabins is decorated with local woodwork and fitted with either a double or two twin beds, a writing desk and ample storage space, as well as portholes for natural light, reading lights for nighttime and power outlets for charging. Every room leads into a large ensuite bathroom. Inside the boat, there’s a large salon with TV, DVD and home cinema surround sound, as well as three separate lounge areas on the bow, aft and rooftop providing plenty of space for relaxing. Interiors are furnished with light teak and emerald green textiles. Outside, there’s plenty of space to catch the sun or recline in the shade. Guests may choose to eat in the indoor dining room or out on deck under the stars. Tambora’s chef serves a range of freshly prepared Indonesian, European and Japanese specialities. Tambora’s onboard facilities include a unique dedicated dive station with rinsing tanks and a full range of rentable dive gear with Nitrox, as well as satellite communication. Tambora was built in 2010 and spans 42m. 8 cabins accommodate up to 16 guests. She cruises at a maximum speed of 10 knots.